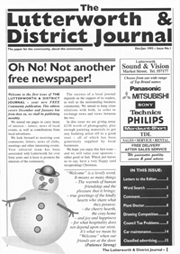 Helen and Trish would like to welcome you to The Lutterworth & District Journal Website. Not Another Free Newspaper!'... how things have changed since then. Helen started the business in 1993 as a hobby whilst working for an advertising agency. Her Grandparents lived in Lutterworth most of their lives and her Grandmother (Trish's mother) used to run a playschool in Woodmarket. Trish grew up in Lutterworth and went to school at Lutterworth Grammar School and then Helen attended the Grammar School. So where better place to start a local Community Journal than in Lutterworth! We publish approximately 15,000 copies with 7 editions a year in colour and black and white. The area covered is South Leicestershire around Lutterworth and Broughton Astley, see our Distribution Area & Copy Deadlines page for more details. Late Night Swith-On, Santa Fun Run and many more events. Helen or Trish on 0116 275 1037 or email us on the link below.